For a lot of the year, you’re too busy to read. There’s all that work you’ve got to do. Kids are in school and need help with their homework. All those short, cold days of winter mean less time for the fun things in life. But then summer comes around, and time opens up. You have a bunch of unused vacation time. Kids are out of school and playing outside. The days are long and warm and beckon you to do the things you really enjoy. That’s why summer is such a good time to read. You finally have the time to pick up a good book. But which one to read? Capitol Hill Books is a great place to ask that question. The staff are all book lovers just like you. They can suggest books for almost any taste or interest. Whether you like a science-fiction adventure, a piece of classic literature or a page-turning biography, the staff at Capitol Hill Books can help you find exactly which book would be perfect for your summer reading. 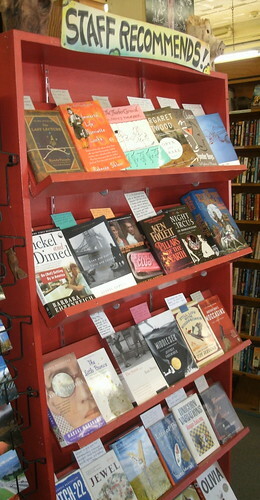 The low prices at Capitol Hill Books mean you can get that perfect read for a lower cost. And no bookstore in Denver has a larger searchable database of used books. So if you’re looking for something specific, or just looking for just something good, Capitol Hill Books and its staff of book connoisseurs will be there to help. This entry was posted in Uncategorized and tagged Affodable books, Capitol Hill Books, Capitol Hill Books Staff, Denver Used Books, Searchable database, Staff, Staff Recommends, Summer Reading, used books in Denver.. Bookmark the permalink.